Welcome to the official web-page for the Nellie Sheridan Wilson Statue Committee. In 2014, members of the Perry County Historical and Cultural Arts Society formed a special committee in order to oversee the creation of a statue dedicated to the memory of Mrs. Nellie Sheridan Wilson. 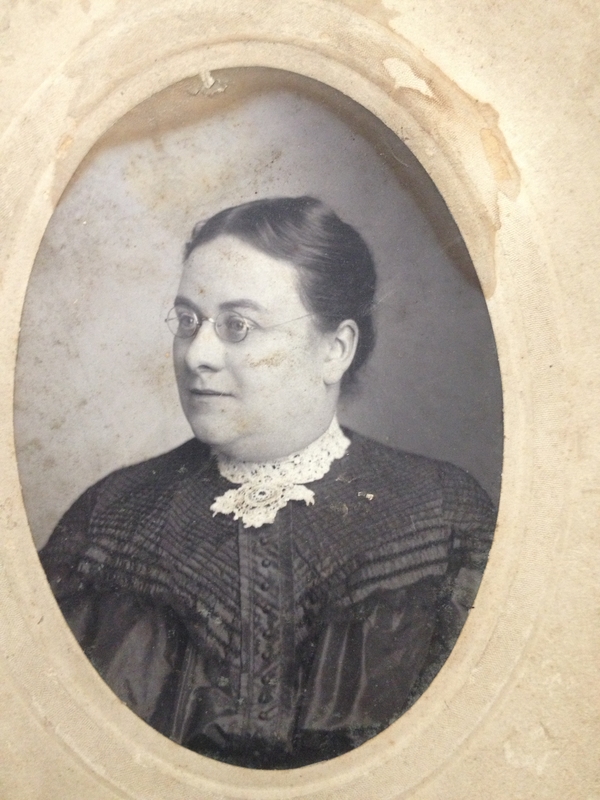 It is the sole purpose of this website to offer insight into the life of Nellie Sheridan Wilson, a woman who exhibited self-determination as a woman working in Appalachian Ohio at the turn of the nineteenth century and into the twentieth century. It is the intention of this site to promote an understanding of Nellie Sheridan Wilson, a most fascinating historical figure, and to illustrate her significant contributions to Somerset, Ohio and how regional identity, family values, community involvement, and the societal norms of the day, aided in shaping her charming yet resilient character. Nelie Sheridan Wilson, daughter of John Sheridan and Kate Gallin, was born in Somerset, Perry County, Ohio 14 December 1870. She was the youngest of two daughters. Her sister, Mary was born 11 March 1868, resided within the village of Somerset her entire life, until her death in 1944. Mary taught musical lessons and was also theatrical. The two sisters in the family home that still stands on Columbus Street. Nellie’s grandmother, an Irish immigrant who was a well-known collector of teapots, was said to be one of the kindest women in the area. Per her obituary,” a poor person never left her home hungry” and “a ragged soldier always had a place to stay.” She was as equally proud of all of her sons as she was of the general. Nellie, like her grandmother, was a constant participant in GAR events and rejoiced in telling stories about her father, Uncle Mike, and dear Uncle Phil. 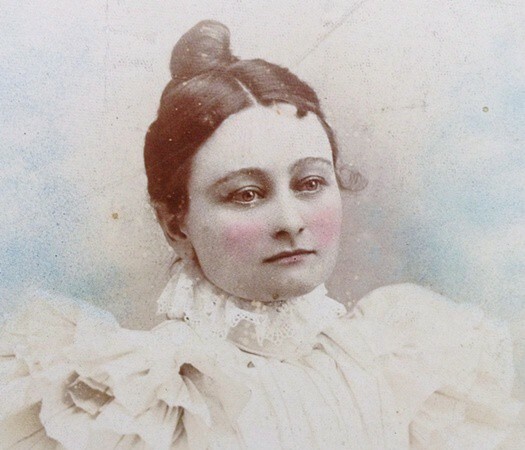 Nellie , the younger sister by three years, was born three years after Mary and flouted convention at a time when women were not considered much more than mere chattel, but the self-proclaimed favorite niece of Philip H. Sheridan had other ideas. Like her valiant uncle, Nellie was indeed a fighter who personified courage and enjoyed pushing the envelope ( a little postmistress humor..). 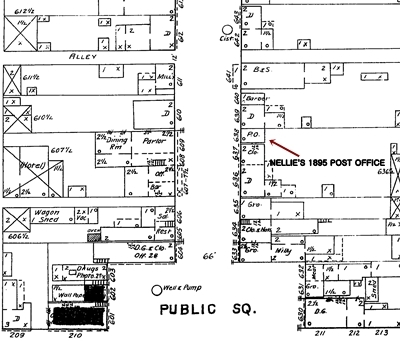 In 1889, when Nellie was just nineteen years old, she declared that she wanted to be postmistress. During that time, women were not encouraged to hold the office. In fact, the powers that be did everything to discourage women from entering the field because it lessened opportunities for men, who were the traditional breadwinners, to hold the position. Consequently, women who were appointed earned less than their male counterparts. Nellie earned a handsome $1,700.00 per year. Postmaster General Payne composed an order which essentially stated that any woman serving as postmistress, must remain unmarried or resign. Postmaster Payne’s policy followed his , and the general philosophy then, toward working women and their degree of commitment and self-reliance. It was his philosophy that women working in the field were less likely to marry and depend on their spouses for income. He also felt that men were better suited for the position. 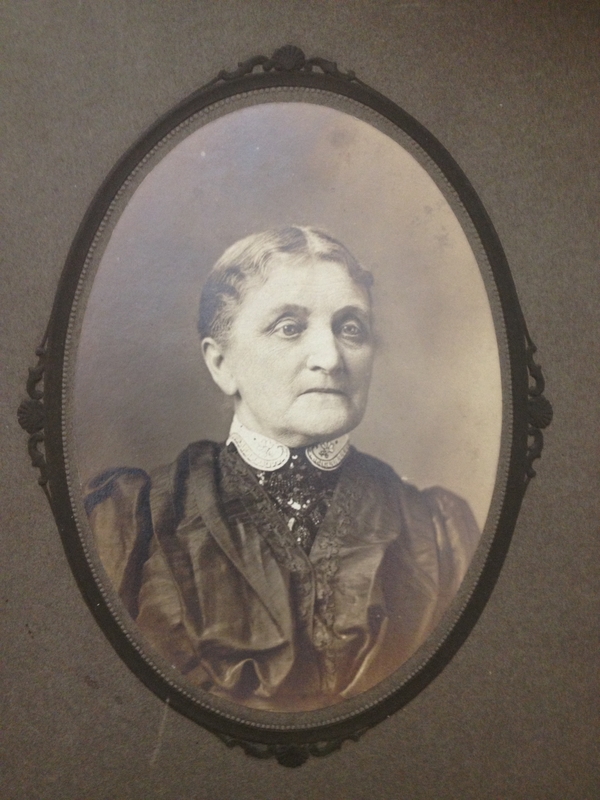 Be that as it may, Nellie, with true Sheridan spirit and determination, filled the position at Somerset and served the area well for twenty-five years. When one examines her life story, one wonders why she wanted to remain postmistress if not purely as a matter of principle. Nellie was an exception and an example in her day – a ‘suffragette ‘ making her way before Suffrage was established in law : she did it, she held office. In addition, Nellie had a flair for the dramatic arts and performed in local theater productions. Once during one of the quirky days of her youth, she scratched the window of her grandmother’s home to see if a diamond ring, which had been given to her by an unknown suitor, was real. However silly and charming young Nellie was, she also had a serious side. Like their grandmother, Nellie and her sister Mary often attended GAR events, spoke, placed wreaths, sang songs, and remained active in the cause their entire lives. When Nellie married, she was a bride only for one night as her beloved, Thomas Wilson, a wealthy merchant who had selflessly been her significant other for fifteen years and sacrificed their marriage and chances of family for Nellie to continue her career, had ultimately succumbed to Bright’s Disease, a condition that he suffered with for over one year, on the very night of their wedding. Nellie, who was forced to resign her position the previous day, was forced to fight to retain her position. It wasn’t easy. After his death, she never remarried and retained the name of Wilson. 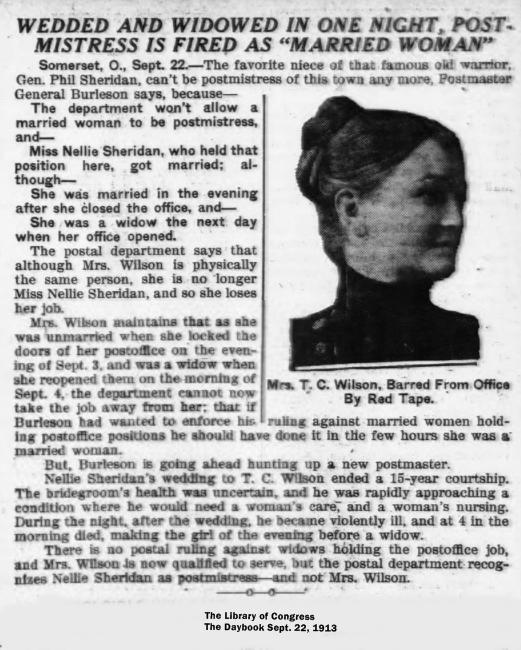 However, she did serve as postmistress as Nellie Wilson. Somerset resident, Jim Young stated that when he was child, he visited the old post office (located in the building that is now Underwood Hardware), recalled Nellie as “flamboyant.” She dressed to the nines in her large hats and was a well-known person within the village of Somerset. Jim recalled, that she liked him because she always smiled at him. Jim attended Holy Trinity School as a youngster and to avoid the long walk from Young’s Farm, he used to stay in Somerset with his grandparents. It was his task to obtain the mail each day. Jim is the only person that we know of who knew Nellie personally. If you know of anyone else, please have them email the historical society. Nellie was an extraordinarily interesting person who was anything but boring. She possessed a vivacious Irish spirit and was the embodiment of self-determination. She was..a survivor. 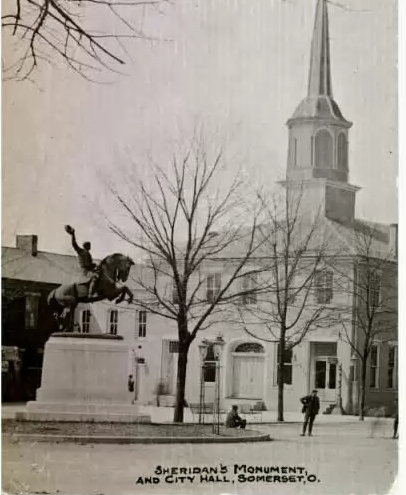 When she died in 1947, the old Somerset Courthouse rang its bell in her honor and people stopped on the square to pause and pay homage to the former civil servant and friend, Mrs. Nellie Sheridan Wilson, Somerset Postmistress extraordinaire. * The Nellie Sheridan Statue Fund operates under the aegis of the Perry County Historical and Cultural Arts Society and is a 501c3 organization. What an amazing woman and what an incredible story. It is absolutely mandatory that her story be recorded and preserved for future generations. You have done this eloquently. Good luck with the statue. What an amazing story. Glad to have you following. I’m a writer and have published 6 bks so far. See my blog (which has 30 entries so far) with bits about my books as well. More about your blog later. Sure, Nellie was a progressive woman and would enjoy the attention. Recently, we published a book on Nellie and are in the process of another one. She was quite an interesting character! This is such a fascinating story about Nellie. Thank you for sharing. Is this anything you would consider for a reblog? I think that it shows a lovely way of storytelling about folks. You are welcome to reblog it. Thank you for your kind words. Nellie was an example of how one person can truly make a difference. She was ahead of her time. I’m a new transplant to Ohio. I appreciated your visit to my blog and enjoyed this article about Nellie. It was interesting because my mother was the first woman postal employee in Davenport, Iowa, in the early ’60’s, and she had to put up with a lot of male prejudice. She survived because she’d spent 4 years in the Navy and also had grown up with 5 brothers. Please, keep up the good work! Glad to have the committee following my blog. Hope some quips are of interest. Very best to you, your blog, and all endeavors favoring the memory of this amazing woman. Thank you for the reblog! Nellie would be pleased! An intriguing story of a pioneering woman! Nice bio, as well as usage of some first-person narrative from Jim Young, and hope you have done Jim’s full oral history for your files. Nellie makes an excellent title for your website also! We wish success to your Perry County organization. Love learning the “real” history of people that is never told in history books. Great post! Thanks for acquainting me with this admirable woman. I write a variety of books; some of these are biographies for young readers. Featured personalities are carefully chosen to be positive role models. 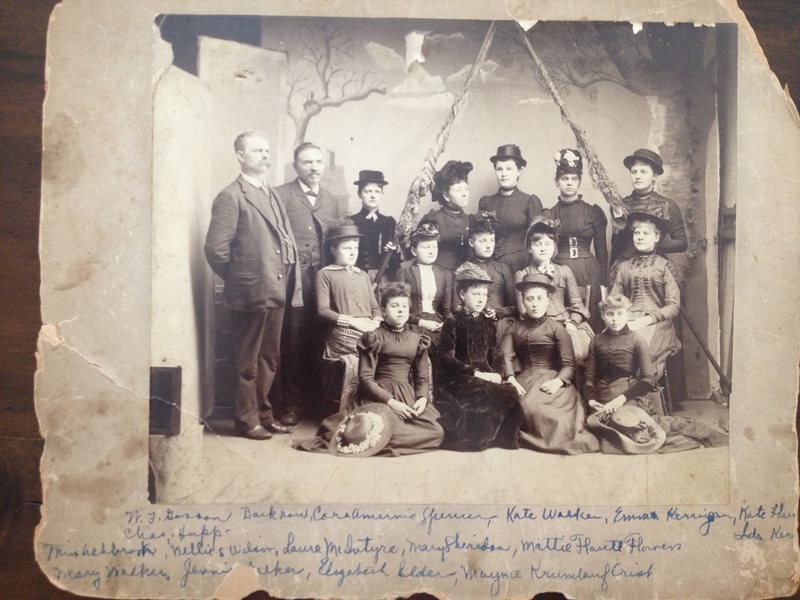 The life story of Nellie Sheridan Wilson fits the bill–I look forward to learning more. What an admirable example of strength and determination! Thank you for introducing me to this fascinating woman and her life story! I hope your project takes shape soon – looking forward to read about its progress. What an inspiring woman Nellie was! Thank you for enlightening me about this determined woman from my home state of Ohio. Thank you so much for stopping by and commenting on my blog!! From where should I begin, I don’t know, but yes, with my Thanks at first, Thank you for visiting my blog, I am so glad to meet with you and with the story of your blog. “Nellie”…. I saw her… I felt her… the excitement of all her works… She was here this morning, at my desk in my silent morning. It was great honor to meet with such a beautiful lady. Thank you for liking “The Unexpected” and for following my blog. Great post! 🙂 I also enjoyed reading about Nellie Sheridan Wilson’s life. I admire her self-determination and her courage to be unconventional. Thanks for liking my article “Damned Yankees and Unreconstructed Rebels.” You have a VERY interesting blog! A truly amazing woman. What courage and perseverance. Thank you for sharing her story and the beautiful way you have written it. Thanks so much for liking and following The Expositrix– and many apologies for being so belated with my thanks! Hopefully, I’ll be back in the blogosphere– and investigating your blog!– much more regularly. This was quite interesting. I love history! Hi Nellie Sheridan Wilson Statue. Many thanks for calling by and wanting to follow my poetry adventures. So nice to meet you. Peace and Best Wishes to An Amazing Lady. The Foureyed Poet. Thank you for stopping by Mocha Muse and for following. I’m honored to be in the company of Ms. Nellie Sheridan Wilson . . . such a fascinating woman! I truly enjoyed reading about her and feel a kinship with her spirit. I’ll be back to explore your site more fully. Many Blessings in your efforts to preserve her memory!! Quite a woman, and a story. Thanks. Very nice to learn about this this charming woman who insisted on contributing to the society around her. Best wishes on your campaign.